Zenario's Dataset feature lets you extend commonly-used data storage areas, such a Users/Contacts, Locations, the new Documents system, plus many custom-built database areas. 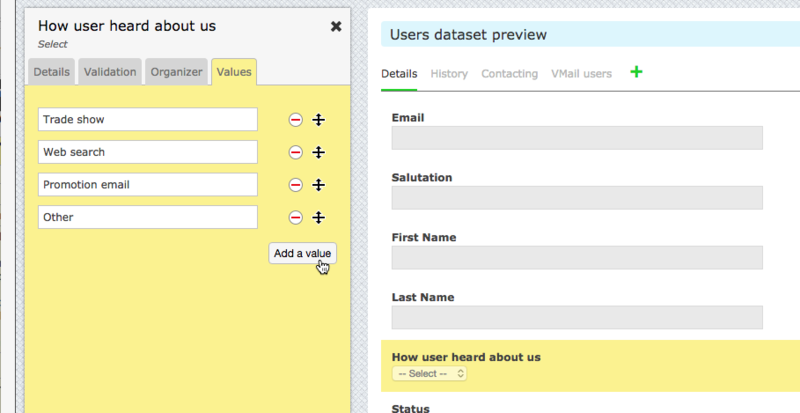 We introduced Datasets some versions back, but it now gets a stunning new drag-and-drop interface. whether a field should be visible in the Organizer panel, and whether an administrator should be able to filter on a field by value, or sort the panel on the field values. 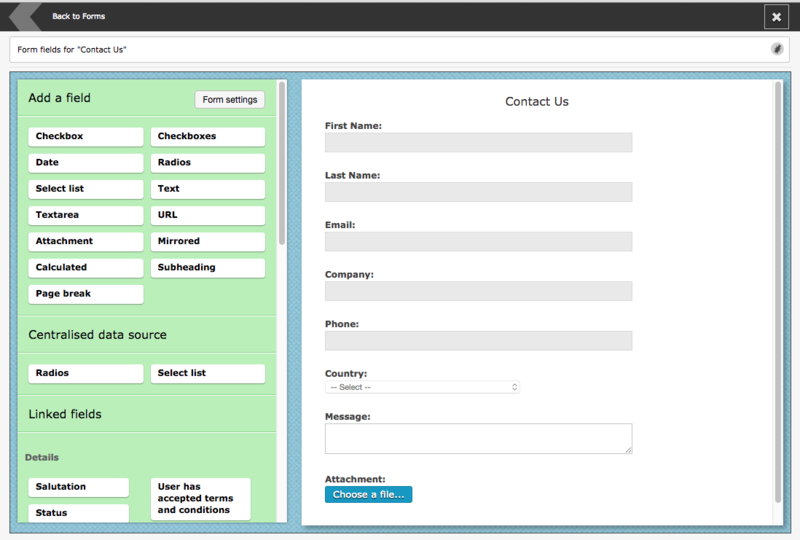 In parallel with the changes to Datasets, we have made some huge changes to the User Forms system. These now have a similar WYSIWYG type interface through which you can define a form for use on a site. 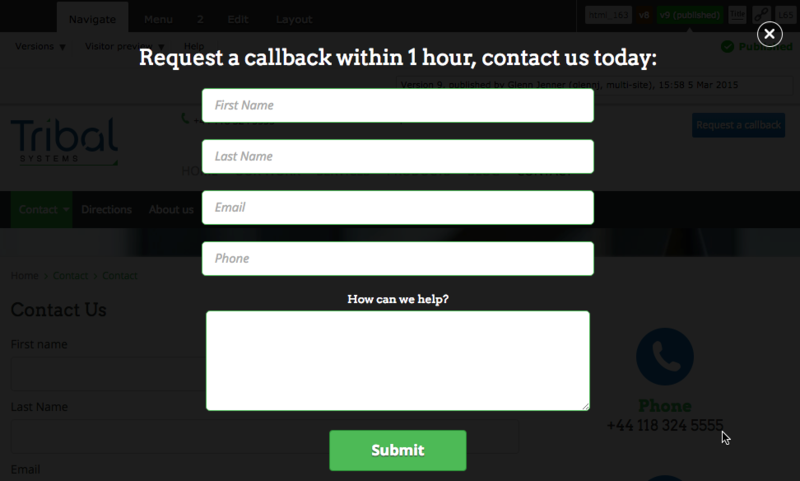 you can add custom CSS to make forms appear exactly the way you want, including multi-column forms. You can build up a form just by dragging fields from the left-hand side to the right. They can be independent fields, centralised data source fields (like a list of countries or regions), or fields that are linked with the Users Dataset. As shown above, you can change the label as it would appear to visitors, its visibility (e.g. it can be visible on condition of another field's value), mandatory, its validation pattern. 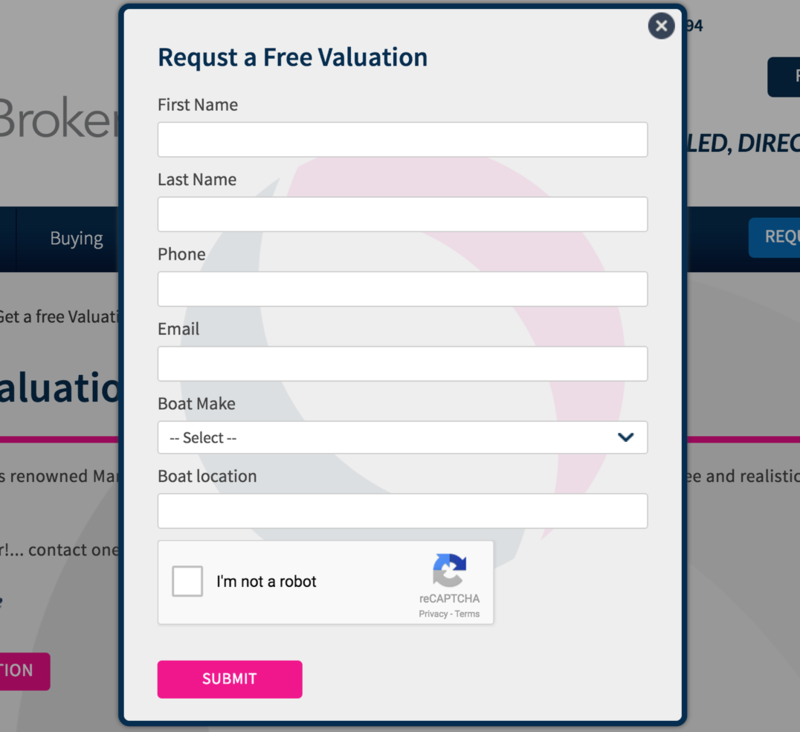 With these Advanced options you can choose to pre-populated the field with some default value; this might be the case on a form that displays previously-stored details, such as an extranet user's profile. For developers, there is an option to "call a module's static method", such that the form consults another module within Zenario in order to pre-populate the value. We have reorganised the Content Items panel in Organizer. It's now more convenient to get to the HTML, News, Blog and other content item panels. If your copy of Zenario has additional content types, they will appear here too. Of course the full range of filters in the "adjust view" panel are still there, but easy filtering can be achieved with a lot less clicking! We are now using the TinyMCE editor in our comments and forum plugins. This has a lot less bugs and a lot more features than the old editor. It now has the ability to include pre-formatted code. The ability to set Categories is disabled by default (to save on button clutter), but it's easy to enable. 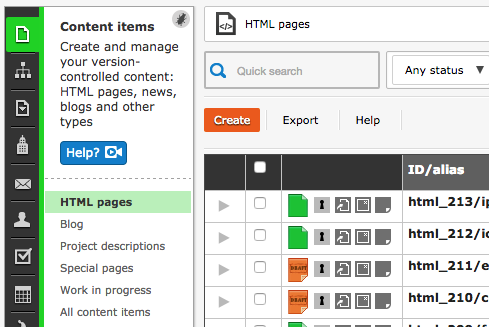 (You would normally only need Categories if you have more than one Content Summary List, e.g. to display different topics of news or blog entries). You can choose whether to see meta tags when you edit content items (we recommend Description but not Keywords). For time-sensitive content, you can make Release Date available for editing, or even mandatory. There's the option to set a Writer field (e.g. 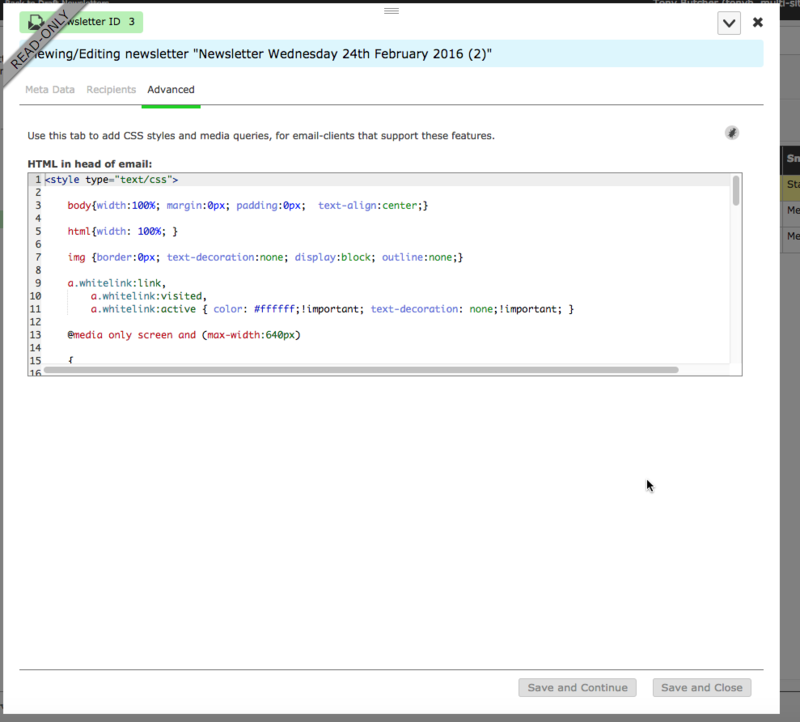 the author of a blog entry) and to enable Summary of the item to be set (this will appear in a Content Summary List, that links to the main content item). 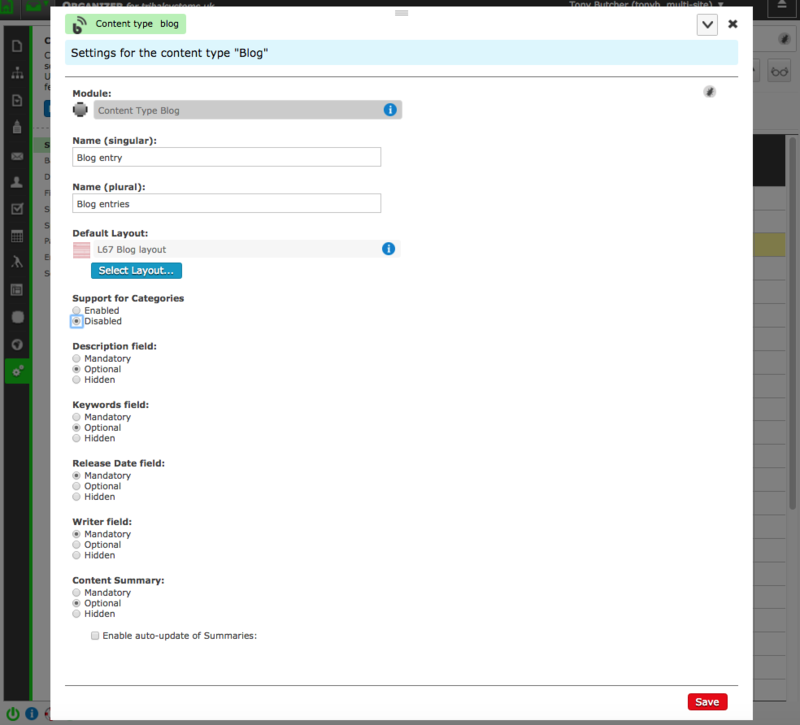 If you have enabled the Release Date or Writer fields, they will now be auto-populated when creating a content item. Once these things are nicely and appropriately set up for your site, your authors should see just the things they need, and should not forget to enter data that are important. Designers can now use CSS styles and media queries when composing a newsletter. This means that you can create slicker newsletters that are responsive when opened by a recipient. To access this, you will need to enter CSS on the new Advanced tab when editing a newsletter. You can now disable the checks for Apache and MySQL in the installer, if you wish to use an alternative stack, such as NGINX. You can now set a port number for the database connection, should you wish to connect to MySQL on a non-standard port number (i.e. other than 3306). When editing things such as an extranet user in a floating admin box, you can now see the id of the user you are editing at the top of the box. The "pickers" in floating admin boxes now show the icon of the thing you selected as well as the name. When you delete an item in Organizer, the next item in the list will now be automatically selected. Fixed a bug where the 'resume' button in the Newsletters Module did not work. Fixed a bug where "double-quotes" were stripped from the filenames of uploaded files. Fixed a bug where the wrong images were sometimes displayed if you put two Image Container plugins on the same page and enabled plugin caching. Fixed a bug where the Create secondary node button on the Admin Toolbar allowed administrators to create a glitched menu node outside of a menu section. Fixed a bug in Organizer where you could not see the label on a page number higher than 999.